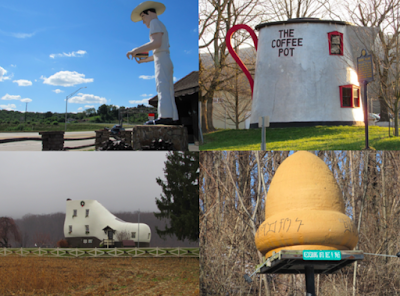 Our travels have taken us to every corner and through every county within the state of Pennsylvania, so needless to say, we've seen some pretty strange, neat, and/or quirky roadside stuff. Most of these places consist of neat Roadside Americana that is sure to pique your interest in some way. These interesting roadside oddities and slices of Americana are some of our favorites. By no means is this an all encompassing list, but this is a pretty good cross section of things that left us scratching our heads, or impressed with beauty. The following list is in no particular order. Alien encounter in Pennsylvania? Some people have sworn that they saw an alien spacecraft crash into the woods in Kecksburg, a rural Westmoreland County village. Witnesses say that they saw a fiery streak across the sky, Plausible explanations for the object include a possible meteor strike, which we see pretty frequently, and a possible satellite coming back down to earth, another common occurrence. Witnesses in Kecksburg say they saw an object about the size of a VW Beetle crash into the woods, with hieroglyphics across the bottom of it. When the incident happened, the local fire department and residents reported seeing the authorities were contacted and the Army and State Police showed up. They claimed to have not found any objects and cleared the area. As with anything that happens, conspiracy theories have arisen. On the 40th anniversary of the incident, an individual with NASA claimed that the object was likely a Soviet satellite crashing back to earth, though this was eventually debunked. On the fiftieth anniversary in 2015, a compelling case was made by some researchers that this was a GE Mark 2 Reentry Vehicle that was part of an American spy satellite. Almost immediately after the crash, the government showed up in radiation suits and a lead box to take away the crash remnants, for they were nuclear powered. Regardless of the case, this is a replica of what the civilians in the area claimed to see on the evening of December 9th, 1965. Pittsburgh's Mary Monument overlooks a busy section of the Parkway East, AKA Interstate 376, AKA the juncture of the historic William Penn and Lincoln Highways. This site also overlooks the Pittsburgh Technology Center that sits on what was once the sprawling J&L Steel Plant, and downtown Pittsburgh out in the distance. Several rumors exist as to why this was erected. One story says that the shrine was erected there after a deadly accident on the Parkway, which dead ended in this spot heading from downtown, prior to completion. Another origin story mentions a steelworker having a vision during a lunch break during a long shift at the old J&L Steel Plant. The plant was one of the largest steel plants in the nation and located where the technology park is located now. Regardless of origin, this sculpture and parklet that can't hurt in protecting the many individuals that traverse this heavily travelled stretch of highway. The family that erected the little parklet area does not mind you going into their backyard and checking it out. They have even set up some benches and a small altar at the site. The Cadet Restaurant a nice little diner outside of Kitanning on Route 422, just off of Route 28. The restaurant has this giant cowboy, said to be thirty feet tall, holding a hamburger and beckoning you to go to the restaurant. He was purchased at the 1962 Chicago Restaurant Show. At one point a truck backed into the cowboy and it took twelve years to get him back into shape. You can read more about the figure from the Cadet Restaurant's website, and more about "Muffler Men" from Roadside America. Within the state, Oaks, Uniontown, Greensburg, and Rockwood still have examples of Muffler Men. International Fiberglass created these and they once stood in great numbers throughout the country. They have slowly faded out as time has gone on. They surely attract attention to businesses, something that was the original intent of the creation of these. Roadside Americana at its finest. Our first stop in Bedford County takes us into what seems to be the epicenter of Pennsylvania's roadside oddities and cool americana. The Abandoned Turnpike is a pretty awesome place to explore and it certainly makes the oddities list. Traveling through the tunnels on the Pennsylvania Turnpike is always fun. Take away the lights and your automobile, and you are in for a thrill. On even the hottest days, you are sure to get a nice chill heading into these tunnels. Do it at your own risk though, and with strong flashlights, since one tunnel measures in at over half a mile, and the other is over a mile long, the longest ever created for the Turnpike. This section of road is right near Breezewood and goes through some beautiful countryside. The roads and tunnel look like they are just frozen in time, with nature slowly taking them back. If you want a preview of a post-apocolyptic world, this is a great place to go. The Koontz Coffee Pot is an awesome example of Roadside Americana. It was built along the Lincoln Highway, one of the original transcontinental highway systems. You are sure to find a bunch of cool things on any journey across this beautiful highway, and the Coffee Pot is one of these things. It was once in lousy shape and about to be torn down, but was thankfully preserved for generations to come. It is located at the Bedford County Fairgrounds. It was once used as a serving counter for food and coffee, as a part of an old service station. The service station is long gone, and if it were not for the vision of the people, the coffee pot may have disappeared as well. This oddball attraction is something you definitely need to check out. Our next stop takes us to an Art Deco gas station right down the street from the giant coffee pot. Dunkle's Gulf Service Station dates back to the golden age of the automobile and is a place that I love to appreciate every time we pass by. It dates back to 1933, and is a breath of fresh air, away from big box America. Gravity Hill is a place where the road cut makes it look as if you are going uphill, even though you are going down hill. It has become a sort of oddball roadside attraction that attracts people from all over. Some people believe that gravity is defied in this spot. While we do not buy into that idea, the drive to it is more than worth some exploration. A number of other spots around the state make a similar claim, though this is the most well known and the drive to it is extremely scenic. The Lincoln Highway, as one of the oldest major highways in the nation, is filled with awesome Roadside Americana. In the small town of Schellsburg in central PA, there was once a "storybook forest" park, where larger than life figures represented different chidren's stories. These parks sprang up all around the country in the post war years as families grew and road travel flourished. One of the few examples of these parks remains in operation as part of Idlewild and Soak Zone, just down the road on the Lincoln Highway in Ligonier. Most of these parks have disappeared, without many remnants even hanging on. Schellsburg's Storyland is one of the few that has closed, AND still has some remnants having around. It closed decades ago, but reminders of it still hang out at the road, and in the woods with a giant Pied Piper still sitting in front of the property. You are welcome to pull over to the shoulder of the road to see the Pied Piper and the remnants you can see from the road, but the rest of the place is private property and part of the Piper's Country Originals Store. The Pied Piper is just another random roadside sculpture that is pretty neat, earning it a place on this list. In Bucks County there is a boulder field that is filled with a series of boulders that have a relatively unique quality to them, they ring. Using a hammer, you can make these boulders ring, and thanks to the different sizes and qualities of the rocks, you can even make songs using the different notes that they ring. It is a pretty neat thing. It helps too that there is a nearby waterfall and different attractions that make this region fun to explore. Ringing Rocks Boulder Field is a fun place to check out. For more information on visiting and for its location, check out our article. A hotel and restaurant dedicated to potatoes? You can find that in Potter County along the Route 6 corridor. This is certainly an oddball attraction and a fun place to spend the night. It has a very basic motel and a restaurant that has standard american fare, steaks, seafood, burgers, and sandwiches, along with potato options, including potato bacon soup, and other specialties. Nearby are multiple oddities mixed in with the natural beauty of the area, including the Coudersport Ice Mine, a geological phenomenon that leaves an cave area filled with large icicles as the weather gets warmer through the year. Additionally, nearby Cherry Springs State Park is home to the darkest skies on the East Coast. For more information on visiting, check out our articles at this link, and this link. There are a number of rock cities throughout Pennsylvania, though Bilger's Rocks in Clearfield County is practically a labyrinth. It legitimately feels like you are in a different world, with small passages that weave through the giant boulders that are pine needle, moss, and lichen covered. This is a neat oddball attraction that you should certainly check out. For more information and location information, check out our article. The Haines Shoe House, just outside of York, on the historic Lincoln Highway is once of the coolest pieces of roadside americana that I have seen. It story is about as American as it gets. An entrepreneur, Mahlon Haines, built this shoe house along the busy Lincoln Highway to advertise his regional chain of shoe stores. While his little shoe empire has gone by the wayside, his giant shoe house has endured and become a neat piece of Roadside Americana that is impossible to miss as you pass it. 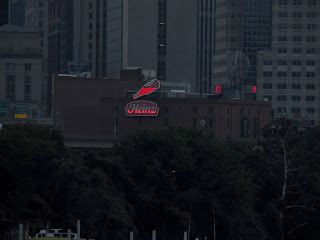 The owners offer tours of the shoe, along with a nice ice cream and food stand that you definitely need to check out. Extra Tip: Fifteen minutes northwest of the shoe house is the world headquarters of York Barbell, home to the York Barbell USA Weightlifting Hall of Fame. A 7.5 foot sculpture of Bob Hoffman, the father of modern weightlifting and founder of York Barbell, stands on top of the roof of the famous factory. For more information on visiting, check out our article. 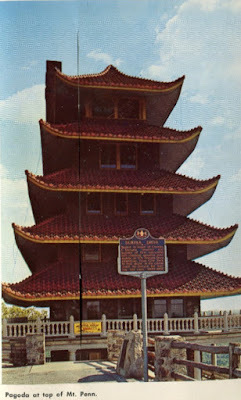 Speaking of zany buildings, it is not often that you see a pagoda stateside, let alone atop a mountain in Reading, PA. For roughly 111 years, the pagoda has stood seven stories tall atop Mount Penn, overlooking Reading and standing as an enduring symbol for this city. Quarry owner William Abbott Witman Sr. noticed that his rock quarry was severely damaging the mountain, so he wanted to build something aesthetically pleasing to cover the damage to the mountain. His intention was to create a resort, but due to financial troubles and the denial of a liquor license, the pagoda was sold, and the new owner sold the building to the City of Reading for only one dollar. Since the sale, the city has operated the building for public enjoyment. On the way up, don't forget to check out the anchor from the USS Maine. Be sure to REMEMBER THE MAINE! You don't expect to hear much about history regarding Marie Antoinette when you are in Pennsylvania, but that is exactly what you find when you are in rural Bradford County along the Susquehanna River. A settlement was built in this location for exiled French elites during the French Revolution and colonial unrest, namely with the success that the Haitians had in freeing themselves from French colonial rule. Many exiled French nationals and elites ended up coming to this beautiful area in the Susquehanna Valley and starting new lives at this settlement, with some permanently staying in the region. It is rumored the Marie Antoinette, pending a successful escape, may have ended up in this settlement. We all know how that ends, but she may very well have ended up at the French Azilum settlement, and the Marie Antoinette Overlook on beautiful Route 6 overlooks this beautiful place. Both the settlement and overlook are open to the public to explore. Ever have the urge to get yourself a delicious Dairy Queen burger and Strawberry Shake, and then head off to the moon? You will need a few more components to make this happen, but this piece for an Apollo Rocket, outside of the Dairy Queen in Franklin, PA, will help you get on your way to that goal. For more location and background information, check out our article. In Pittsburgh's Shadyside neighborhood, there is a little residential neighborhood that would be not be remarkable if it were not for the paving method of the street. There are only a handful of streets that remain that are wooden. Roslyn Place consists of treated and cut up rail ties. The only other example within the state resides in Philadelphia. Wooden paving was created as a method to try to cut back on the loud sound that the iron wheels on wagons made when traveling across cobblestone roads. Daffin's Candy is a local institution in Sharon, PA, and it is home to the Chocolate Kingdom, a place filled with chocolate sculpture creatures, the largest of which is a turtle, said to weigh four hundred pounds. The smell of chocolate in this room is awesome, and only eclipsed by how delicious their chocolate is. A candy store and museum dedicated to elephant figurines? Mister Ed's Elephant Museum is a work of love that is a lovely piece of roadside americana along the storied Lincoln Highway. 12,000 elephant figurines accompany every kind of candy you can possibly think of in this funky museum and candy store. Public art seems to be an overall theme of this list. Some great creativity by Allegheny College turned this otherwise mundane PennDOT road maintenance building into a public art installation, by repurposing old street signs into a giant roadside display that commands your attention at the crossroads of historic Route 6, Interstate 79, and US 19. As a railroad fan, sleeping in a caboose is always something that appealed to me. While we seldom see cabooses in use with daily freight and passenger trains these days, a series of these cabooses have been nicely repurposed into hotel rooms at the scenic Oil Creek and Titusville Railroad and the Strasburg Railroad. This is a one-of-a-kind experience that is fun for both rail lovers and people who like unique experiences. Waking up to the sun rise from the top windows of the car and sitting out on the adirondack chairs outside of the caboose at Titusville's Caboose Motel was so relaxing and one of the highlights of our summer last year. Near the Caboose Motel, in addition to the Oil Creek and Titusville Railroad, you will find a torpedo monument at the city's football stadium, where John Heisman learned the sport that he would forever change. For more background and location information, be sure to check out our article and their website. Decker's Chapel in Saint Mary's, PA is one of the world's smallest churches, measuring in at 12 by 18 feet, though, in my opinion, this is not the most compelling part of visiting this little landmark. This chapel represents the will of a man who worked in an orchard, fell, and, due to his serious injuries, had a pretty bleak outlook in regards to his future. He said that if he ever recovered, that he would build a chapel. His ethnic group, Bavarian Catholics, ended up in the region, for they had faced religious and racial intimidation in Baltimore and Philadelphia. They moved up to Elk County in the area of St. Mary's, having purchased this remote land for only 75 cents an acre. The father had overcome that, and later overcame his injury and built this chapel. His son went into the priesthood, and the chapel was dedicated in his honor. The backstory of this place is so compelling and so relatable, as a small town story and the kind of will that makes up the American spirit. This one is pretty self explanatory. Bringing out a strange, albeit cute, and giant rodent to predict the weather, with a huge tradition and celebration is certainly quite odd. The fun in Punxsutawney does not stop though once the party is over in February. You are free to visit Gobbler's Knob, visit Phil's Burrow at the town's library, and see Punxsutawney Phil and his wife in their residence, in addition to seeing dozens of statues spread throughout the area as a public art installation. All in all, Punxsy is a ton of fun to visit and well worth checking out. For more background and location information, be sure to check out our article. One of the oddest things about Centralia is that it is such a huge tourist draw. I just did not get the attraction to it, but the fact that this place piques the interest of people is what makes it an oddity. The idea of a coal mine burning underground is intriguing, but only as a case study on why we need to be responsible with our environmental practices. A large portion of the area is still publicly accessible, except this spot, the "Graffiti Highway," an area that is illegal to visit and not worth checking out. It is an abandoned highway with a bunch of graffiti on it. The rest of the place is a barren wasteland with some occasional smoke/steam coming out of the ground in places. The areas immediately around 61 are still open to checking out, though there really is not much to see, even in the area that is now posted "no trespassing." The idea that this barren wasteland is an attraction is what stands out as odd to me personally. This place is not unlike many of the industrial brownfields where large factories were once located, abandoned and completely torn down towns and neighborhoods, strip mines, slag piles, drilling sites, other mine fires, and other environmentally degraded places. There is really not much to see here. If you have seen any of those things, you have practically seen Centralia already. Extra Tip: I would not recommend making a special detour to visit this, though it is within a half hour of two of the finest places to visit anywhere, Knoebels Amusement Park, and our nation's oldest operating brewery, Pottsville's Yuengling Brewery. For more background information, check out our article. Seeing war machines is something that is typical throughout towns. One of our favorite shows is M*A*S*H* and one of the plot lines immediately came to mind when thinking about what to write for this. In the Dear Comrade episode, one of the side plot lines involved a poker game between a visiting Sergeant Cimoli and the regulars at the 4077: Hawkeye, BJ, Margaret, and Winchester. The sergeant loses, and promises to deliver a jeep to Hawkeye. Some time passes and instead of a jeep, Hawkeye is shocked to find out that a Howitzer is delivered to him, something that would put the army medical unit in danger. In classic Hawkeye sarcasm, he says "why don't I just leave it here and build the town square around it?" There is something troubling, but humbling, about seeing major weaponry sitting on display in a town. It is a reminder of the sacrifices that individuals have made, and also a reminder on how we need to avoid war at all costs. It is comforting to know that these weapons sit in retirement and are no longer in use. You will often see tanks and cannons in town squares and roadside. Less common are old army helicopters and fighter jets. A number of them remain, largely at VFW posts, in addition to one at the US Army War College in Carlisle. The fighter jet at the Erie County Memorial Gardens at the corner of Interstates 90 and 79 always catches my eye too, with its Korean era PA Air Guard jet. Extra tip: Southwest of the US Army War College on I-81, you will see a giant paint can, in addition to two giant highway signs: one with a full size tractor trailer, and another with a limo, sitting on poles about thirty feet in the air. Heading westward on Route 30 AKA the Lincoln Highway, will lead you to the giant apple truck, another neat roadside adornment. This picture was taken over a mile away from the sign! The Heinz History Center is the largest local history museum in Pennsylvania and it is dedicated to the evolution of Western Pennsylvania and its impact upon society as a whole. In 2007, the museum became home to this giant electronic sign that was located at the old Heinz Plant in the North Side of Pittsburgh. The sign was originally created in 1995 to commemorate the 125th anniversary of this iconic company. When the plant was sold to Del Monte Foods, the sign had to eventually come down. The sign was moved to the history center and given this prime spot, overlooking Pittsburgh's Strip District, Interstates 579 and 279, and the Allegheny River. Nearby in the city's South Side, you can find the Duquesne Brewery clock, one of the largest clock faces in the world. Pennsylvania, has the the most wooden roller coasters in the entire state, including the world's oldest, Lakemont Park's Leap the Dips. It was built in 1902 by the E. Joy Morris Company. Through a stroke of luck and a labor of love, the coaster has survived the years, become the oldest roller coaster on the planet, and it is a ton of fun to check out. 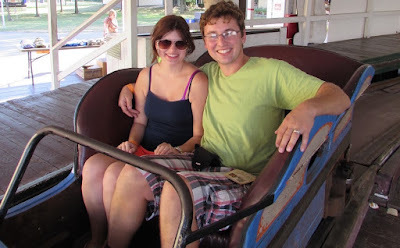 Lakemont Park is also lots of fun and very inexpensive to visit, making it a place we recommend checking out. We have spent many glorious summer afternoons at this pleasant little amusement park. For more background and location information, check out this article on our other page. The Jenny globe sign is one of the first things you will see when you get to the Somerset exit of the Turnpike. The sign spins and talks about the nearby Steam Jenny company that was the first to create steam cleaners. The sign is made of fiberglass and dates back to the 1960s. Be sure to pay attention to the road as you pass this, for it is easy to get mesmerized. Extra tip: At the Eat N' Park Restaurant, you will see a random elephant sculpture at the corner of the road. Extra Tip: Enjoy the area surrounding this in the PA Great Outdoors Region and the Allegheny National Forest. This is a remote and beautiful region. The Linesville Spillway is one of our favorite attractions in the state This "where the ducks walk on fish." This is the place where any inedible bread or cereal needs to be taken. The carp likely number in the thousands in this single spot on any given day. The fish get so huge that some of them can even swallow an entire hot dog roll in one swoop. There are so many fish here that the ducks can actually walk on top of the fish, without being submerged at all, when they go to scoop up the food thrown in by visitors. The spillway has attracted visitors for generations, stemming back to the Great Depression, and later rationing during the World War II effort thanks to it being a fun and affordable destination to take families. This roadside attraction is extremely popular, attracting many thousands of people throughout the year, often heading to or from the awesome Conneaut Lake Park. Nestled alongside the old William Penn Highway corridor, aka Route 22, and Interstate 78, is Roadside America, a phenomenal miniature railway exhibit that is a great slice of Roadside Americana. For 76 years it has amazed travelers along the historic William Penn Highway/Route 22 corridor in agrarian Berks County. The handiwork of Roadside America has attracted curious travelers for generations. Extra Tip: Be sure to check out the nearby beached ferry that is very far away from any sort of navigable water. That leaves us in a pretty good spot for checking out Pennsylvania's roadside oddities, architecture, and overall Americana. These are only a few of the many neat and/or odd things that you will find, certainly not an all encompassing list, though these are some of our favorites. You will find something neat with pretty much every turn you take in the state, so get out there and explore. Great article! Fun places to take the grandkids!